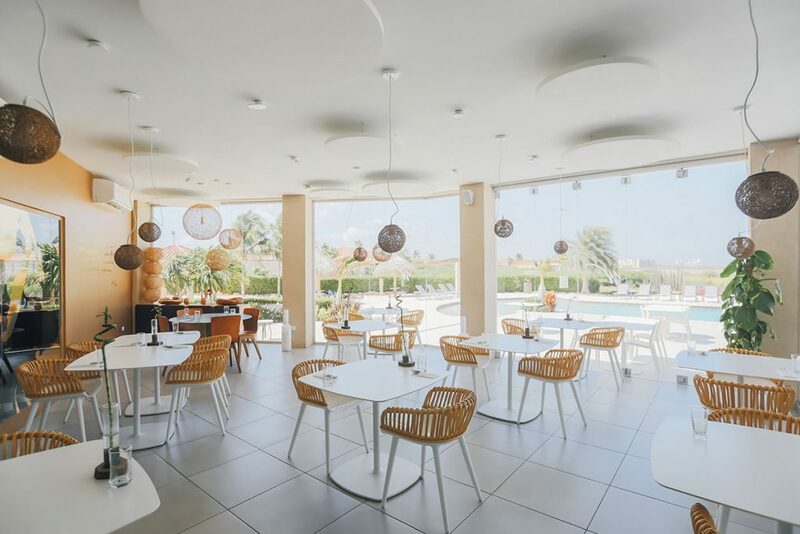 Summer was gently drawing to a close in the UK, but not for myself and Cheeky, for we had been invited on a romantic holiday to have one last fling with the summer sun on the Dutch Caribbean island of Aruba. I must admit that I did not know much about the island, so I was intrigued to discover more about the history, the customs, the environment and of course the cuisine. We hopped on a KLM flight to Amsterdam and due to delays had about 20 sweaty minutes to run to our connecting flight, who said travel was glamorous? Three or four films later we touched down on the runway of Queen Beatrix International Airport. Of course 20 minutes was never going to be enough time for our luggage to run for its connecting flight, so we were travelling rather lighter than expected now. However, we jumped into our ride and made our way to what would be our home for the week, the Aruba Marriott Resort & Stellaris Casino on the north-west side of Aruba. 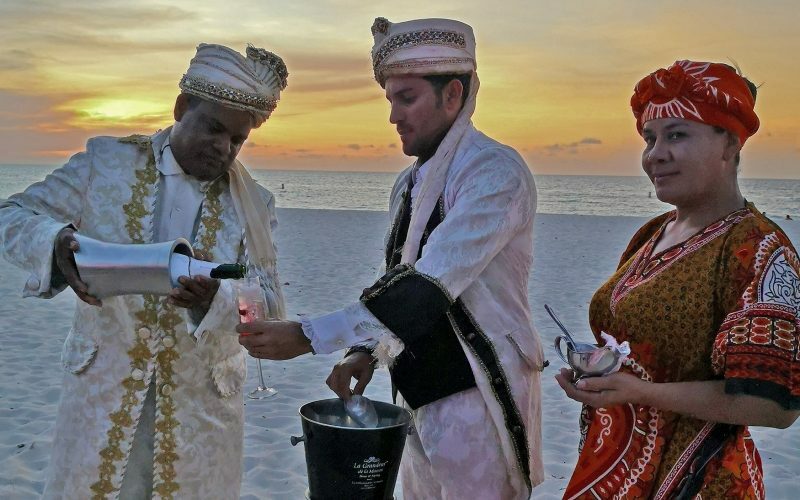 We entered into the very large and grand entrance, this would certainly do for the week; we freshened up the best that we could and made our way to the hotel’s beach restaurant Atardi for our welcome dinner. Situated right on the white sands of the waterfront, our hearts and souls began to relax and slow to the gentle pace of the island as we sipped our the first cocktail. As the sun set in a pink sky, we tucked into meaty local lobster and threw off the last of the stresses of travel. Who needs luggage anyway? The following morning the Marriott hotel was unbelievably generous, due to us still wearing the clothes we travelled in, they allowed us to select some beach outfits from their two in-hotel beachwear shops, which I must say are VERY well stocked for hotel shops. Once dressed appropriately, we could now enjoy the first of many excursions, a sailing trip on board the Tanquilo. 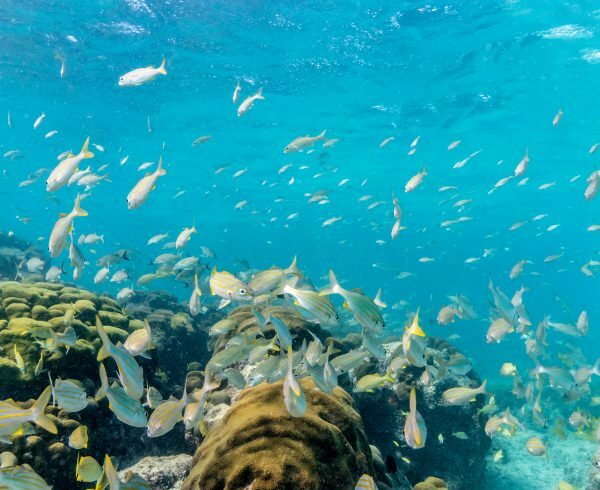 The skies were ridiculously deep blue and the temperature at an all time high, for the usual winds that keep the temperatures of Aruba at a manageable level had been stolen by the recent hurricanes that had been hitting the rest of the Caribbean. Suffice to say we were happy to be going out on the water were it was a little cooler. Captain Anthony welcomed us on to his 43 foot sailing yacht and we made ourselves comfortable on deck with a couple of Pina Coladas (when in the Caribbean I say); what a great start to the morning. 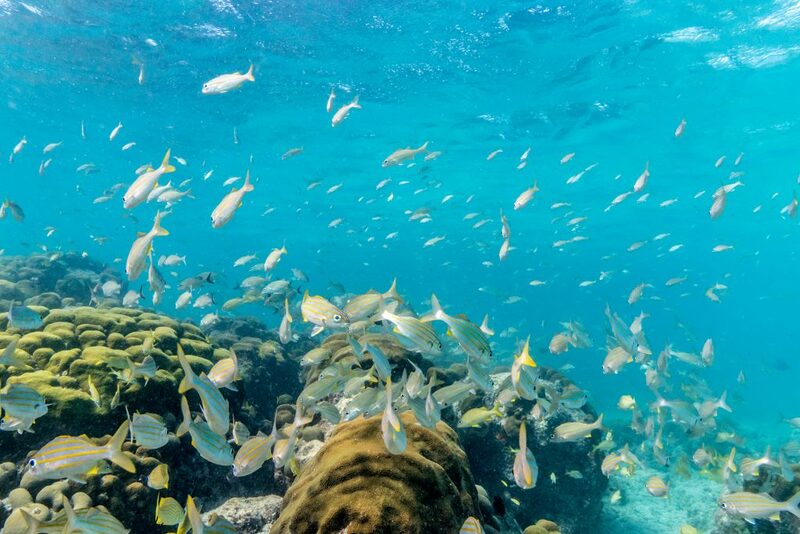 We sailed along between Aruba and the very long and thin Renaissance Island, until we made it to ‘Mike’s Reef’ named after the captain’s father who started the business. Anthony’s father had built a little jetty on some rocks where the waters were phenomenally clear and thus the perfect area for some snorkelling. With such clear shallow waters, this was a great opportunity to spot all kinds of colourful fish and some outstanding reef structures. After a deeper snorkelling session we headed back to the boat for some delicious food and more cocktails. Eventually we headed back to port under the shelter of the yacht’s rear canopy for the sun was beating down with all of its might. After an afternoon of lounging at the beach in front of the Marriot, taking dips in the crystal clear ocean to keep cool, we made out way to Eagle beach for a sunset champagne toast with House of Mosaic, Aruba’s premier luxury organiser for weddings, events and exclusive parties. The devil is in the details where these guys are concerned, the exceptional location was turned into a decedent beach part with finely dressed serving staff, beautifully arranged tables and sunshades, champagne cocktails and the most moreish bites. A few champagne cocktails later, it was then off for dinner at the Screaming Eagle the restaurant that the Caribbean Journal voted number one restaurant in the Caribbean. 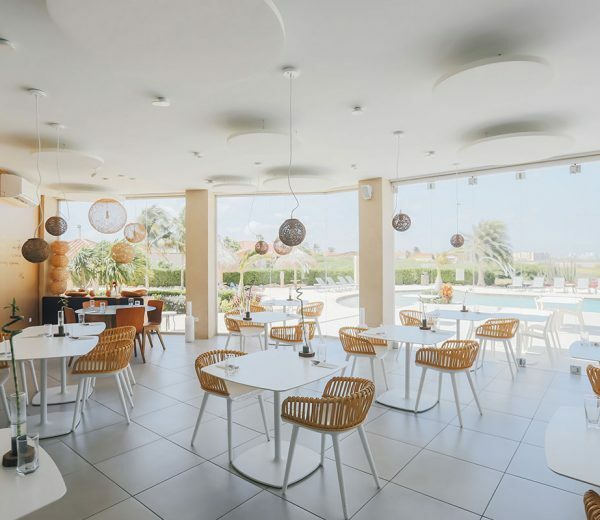 With plenty of fresh seafood prepared in various international ways from Mexican and Asian to Peruvian and French; and some interesting meats such as reindeer, we were in for an evening of gourmet delights. As well as the usual dining tables, the restaurant also offers romantic and rather intimate beds where one can whisper sweet nothings into loved one’s ears, just do not do it with your mouth full. After many sweet nothings it was time to head to bed back at the Marriott. The next morning we drove out to Spaans Lagoon to meet with Aruba Kayak Tours. After some simple instructions, we kitted up and we were off down to the pontoons. Once launched in our Kayaks, we were ready to explore the Aruban coastline with our guide. Once again, because of the lack of wind we made good speed tearing through the calm coastal waters, exploring the rocky shores finding sea urchins, crabs and dozens of Iguanas clinging to the coastal rock face. After a short period travelling south-east we reached Mangel Halto Beach, where we swapped the kayaks for fins and diving masks and once again explored the local seabed, whereupon I spotted a spooky boat-wreck looming out of the depths. Eventually stomachs were rumbling and it was time to jump back in the kayaks and paddle back to Spaans Lagoon. Lunch had been organised at the restaurant Zeerovers, taking its name for the Dutch name for pirate. 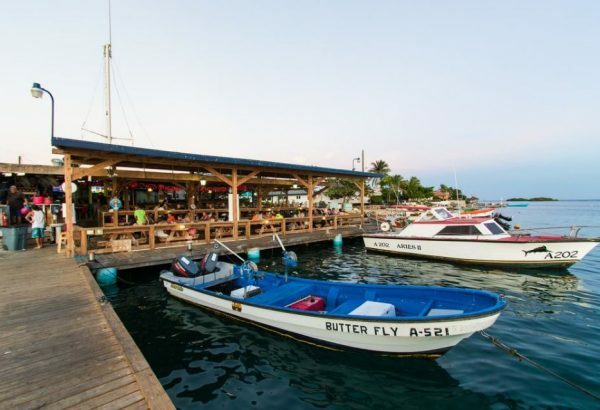 Situated at a local fisherman’s wharf in Savaneta they serve the freshest seafood straight out of the ocean from wahoo, snapper, barracuda to kingfish and when available big shrimps. Sitting right over the water, with baskets of various fish this is genuine Aruban hospitality that should not to be missed! It was then back to the hotel’s adult swimming pool, with no screaming kids for an afternoon of lazing around soaking up some Vitamin D whilst the iguanas posed around us. It was then time to get dressed up for the high seas, for we had a date with Monforte Luxury Cruises aboard their teak schooner. We were welcomed with bubbles and before you could say ‘Aye Aye Cap’n’ we were aboard and sailing out to sea. We explored the various cocktails on board as the sky and ocean put on the most picturesque entertainment for us as it changed colour from gold against light blue to deep marine blue with fiery burning clouds which eventually transformed into the most gorgeous pink candy floss. As the light left the sky it was time to anchor up and sit for our 4 course meal of red snapper ceviche, creole shrimp salad, tenderloin with Lobster and coconut quesillo dessert all with live music; this is a cruise not to be missed, the setting is delightful and the food fresh and full of flavour. After dinner we sipped our way through the wine list whilst putting the world to rights as we slowly meandered our way back to port. We awoke the next day and dressed ourselves for dust and dirt for we were off for a UTV adventure (utility task vehicle) with ABC tours. We drove in convoy across the island to Aruba’s largest park, Arikok National Park; the pace was fast and once we hit the dirt tracks of the park the dust was really flying. We flew along the parks tracks at some pace, this certainly felt like a desert island adventure as we travelled through terrain not dissimilar to Mars! 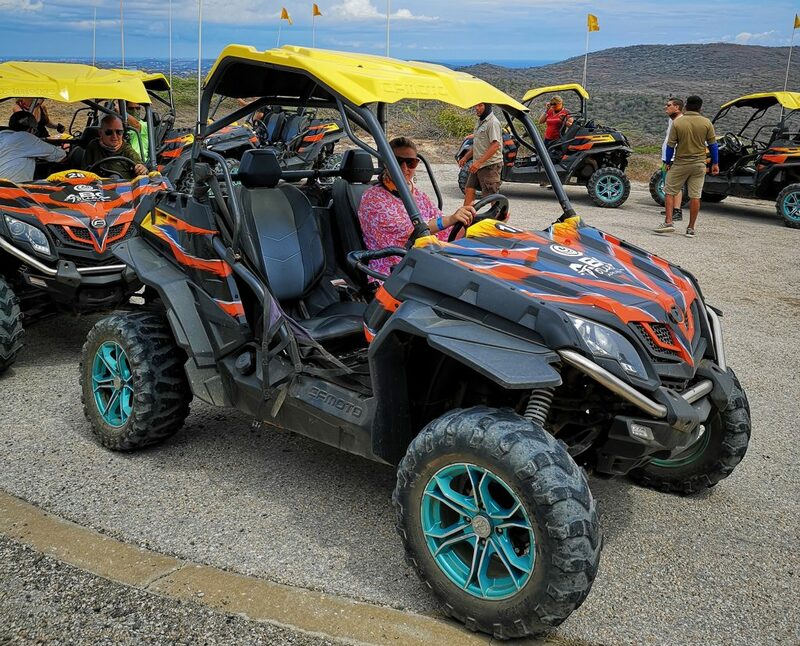 Along the way we visited the highest peak in the park, ancient Indian caves, Dos Playa Beach and went snorkelling in the natural ‘Conchi’ pools. 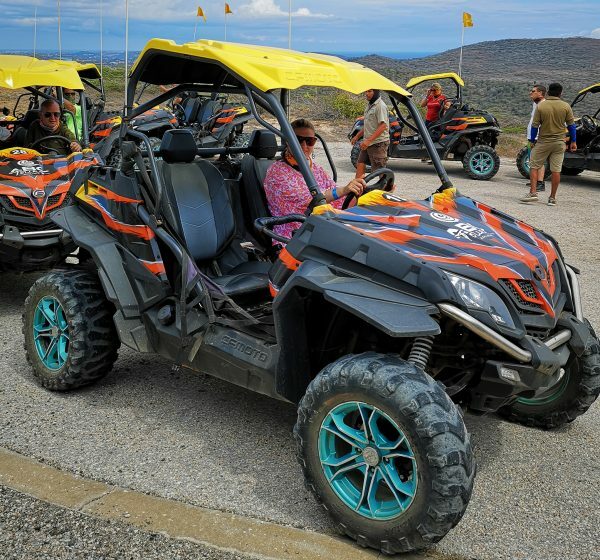 When you visit Aruba, if you like fast paced adventure then do not miss this experience, it is certainly one not to forget. After building up a huge appetite, we made our way to Antesala Cafe for the most delicious lunch of panini’s, wraps and bagels. Make sure you leave space for the iced coffees and cakes which are out of this world. With full bellies we made our way to San Nicolas to see the famous street art. Despite the temperatures, it was so worth braving the blazing heat to walk around the town taking in the giant art dotted around the buildings. 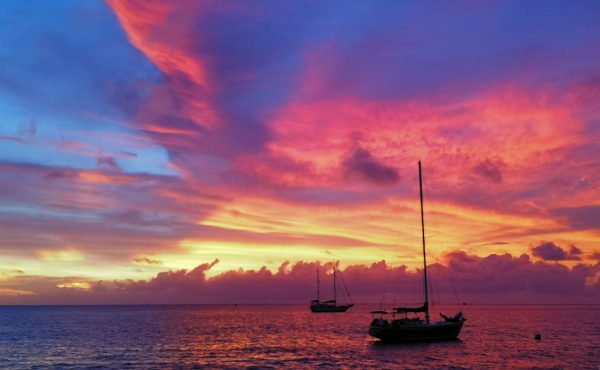 The artists have been invited from around the globe and the variety of styles and skills are spectacular, and has put San Nicolas on the map; make sure to fit this one into your itinerary when in Aruba. That evening we headed out to visit one of Aruba’s most icon restaurants, Papiamento housed in a 126 year old Aruban “Cunucu” house. We sat in the lush tropical gardens and immediately felt at home with the twinkly lights and light evening breeze. The menu is vast and full of many wondrous delights, one will certainly not be disappointed. We had the Neptune, which is a feast of Caribbean Rock Lobster, Mahi-Mahi and Shrimp which one cooks on a hot lava stone and then douses in lemon butter, absolutely delicious! As an alternative to the previous day of adventure and culture, the next morning we awoke ready to reset our chakras with some meditation on the rocks of Tres Trapi with local yoga and meditation guru Maria Pucci. Having explored meditation further since this experience, I can certainly say that this is a great place to practice with the sound of the waves crashing underneath the rocks, Maria certainly provided an inspirational class in meditation. Now our bodies and minds were in balance it was time to fill our bellies once again so we drove over to White Modern Cusine restaurant. The architecture and interior design would not be out of place in Ibiza and the brunch menu was a delight with lots of small dishes, so one could eat through many different and varied dishes from Rosbeef Benedict, ‘Kibbeling’ steamed buns, Chicken Ton Katsu and Tuna Poke to moreish desserts like quesillo and churros all washed down with endless Mimosas. To continue the day of relaxation we headed over to the splendid Ritz Carlton Aruba Spa for a very tranquil massage; today was all about relaxation and I think that we had achieved our goal, any more relaxed and I would be zombified. For our last evening on Aruba we had been booked into restaurant Wilhelmina, named after a beloved Dutch queen. 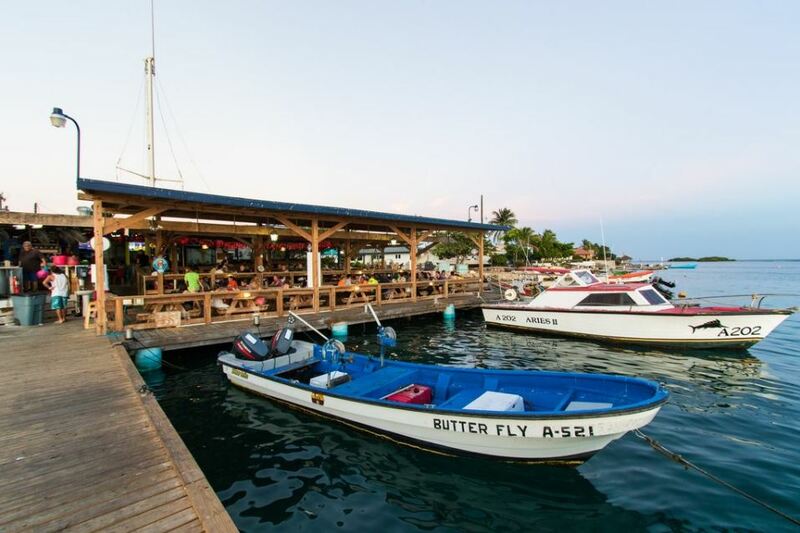 This is fine dining Aruba style with plenty of fresh seafood alongside meat dishes from around the world. The presentation of the gourmet food is outstanding and up there with many of the best restaurants I have been lucky enough to visit across Europe and beyond. Their wine list is also rather impressive so be sure to ask for recommendations with your meal. Aruba is quite different from the other Caribbean island that I have visited; the history is very unique so many of the people are of Indian descent with the Spanish and Dutch leaving something of their genealogy too through their time on the island. However, they do have the same friendly and warm traits that can been found on the other Caribbean islands. Always quick to smile and welcome strangers Aruba was a real pleasure to visit and travel around. The food is delicious and what with local cuisine being fused with dutch fare one could get rather large if not careful, but then when on holiday who cares. 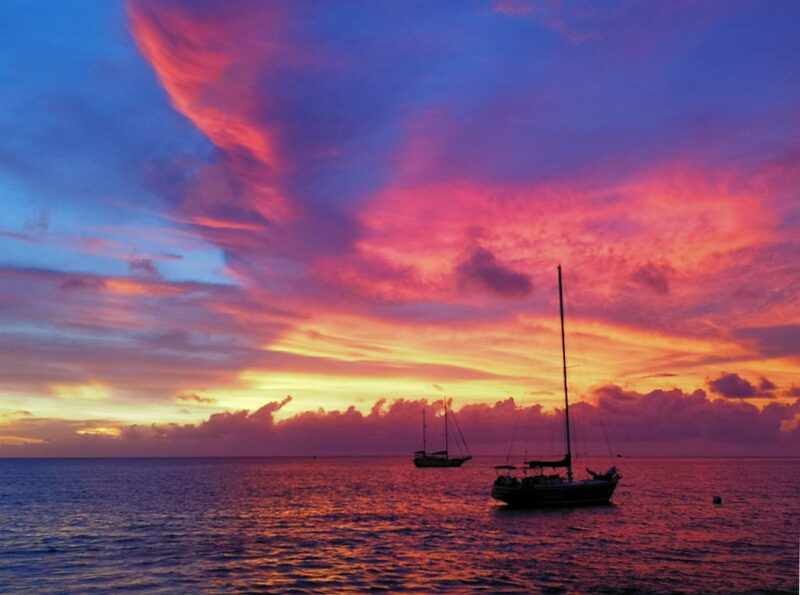 There is so much do and to explore on the island but most of all make sure you do not miss the sunsets every evening, for nothing could be more romantic that sipping cocktails watching the pink Aruban sun sink into the sea. 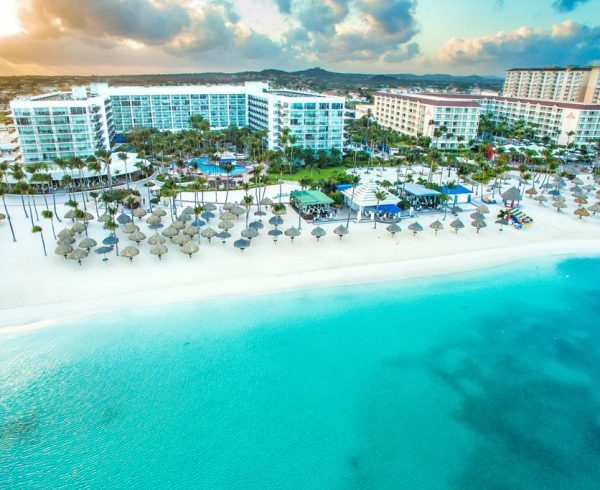 Adam stayed at the Aruba Marriott Resort & Stellaris Casino, L.G. 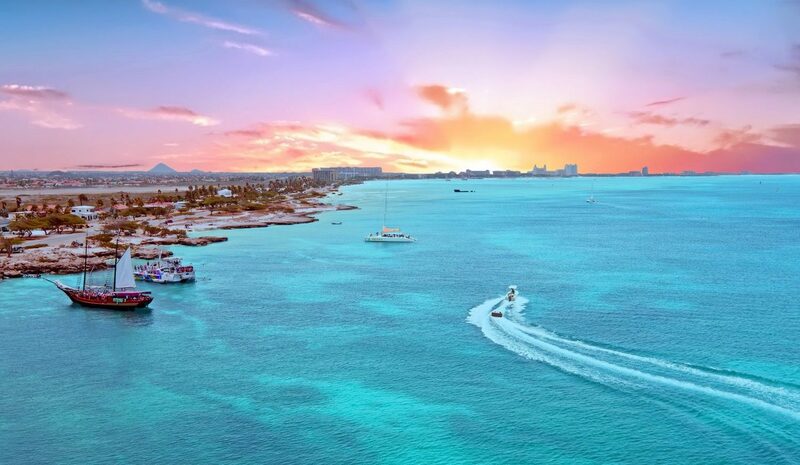 Smith Boulevard 101, Palm Beach, Aruba for details on rooms and rates see online. 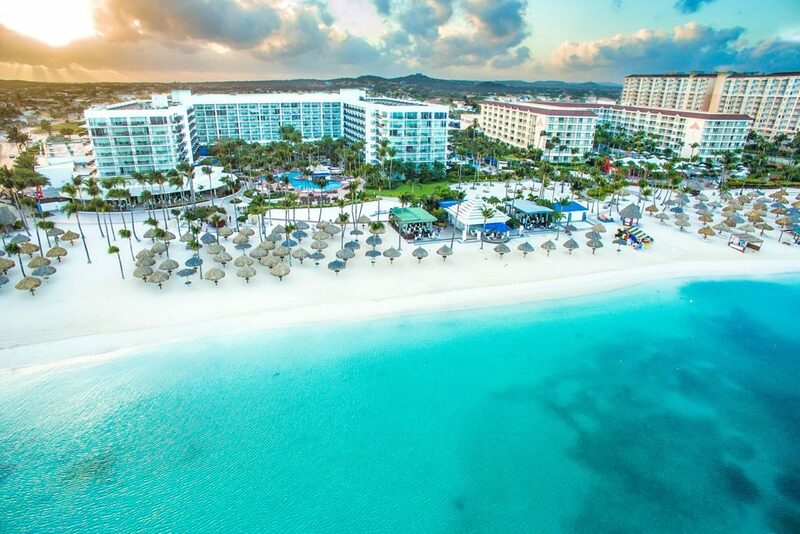 My Caribbean Holiday (www.mycaribbeanholiday.co.uk ) offers 7 nights at the Aruba Marriott Resort & Stellaris Casino from £1,891* per person, in a standard room including breakfast. 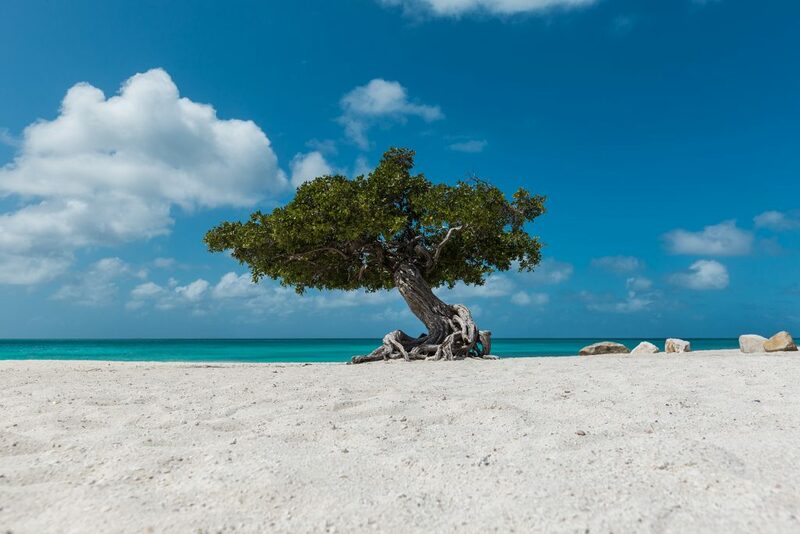 Flights are from London Heathrow with KLM and price includes return airport transfers on Aruba.